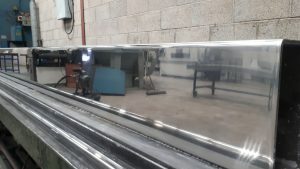 With an ever increasing demand for large stainless steel sections being mirror polished, we are now producing up to 200 x 200 section with plans in place to further enhance our capacity. Images show a 200 x 100 x 6 mm mirrored section to be installed on a flagship retail unit in the south of England. Please contact sales@northwestpolsihing.co.uk for further details.